Oh my goodness… My dog Jasper is fat. I have been trying to watch his diet closely because he should only be about 18 pounds. But, that is not the case. He is close to 30 pounds. Last night as I was watching him lay there and then mentioned the word food. He went for an all out run, if that’s what you call how a fat pug runs,lol. But as soon as he heard food being put in the dish of our other dogs food bowl, he was up and out of the room. He was on his way to gobble up Patsy and Parker’s food. He had his food gone within a minute or two, and then he sits there and waits for Parker to turn his back and gobbles his down. After that he is waiting at the back door to see what is left in Patsy’s bowl. So he eats three days worth of dog food in a ten minute time frame. So now, he is grounded to the bedroom when he eats and has to wait till the others are done. Jasper is none to pleased over this. I was reading up on how to make him loose weight. I may not be his favorite on this topic. They say that pugs should have an hourglass shaped body. The shoulders and hips should be about the same width. There should be a small indention at the waistline. If your pet has a rectangular shaped body, then he is probably overweight. Jasper doesn’t have the perfect hourglass shape at all. I hope he isn’t going to get a complex by me calling him fat. But it is what it is, lol. 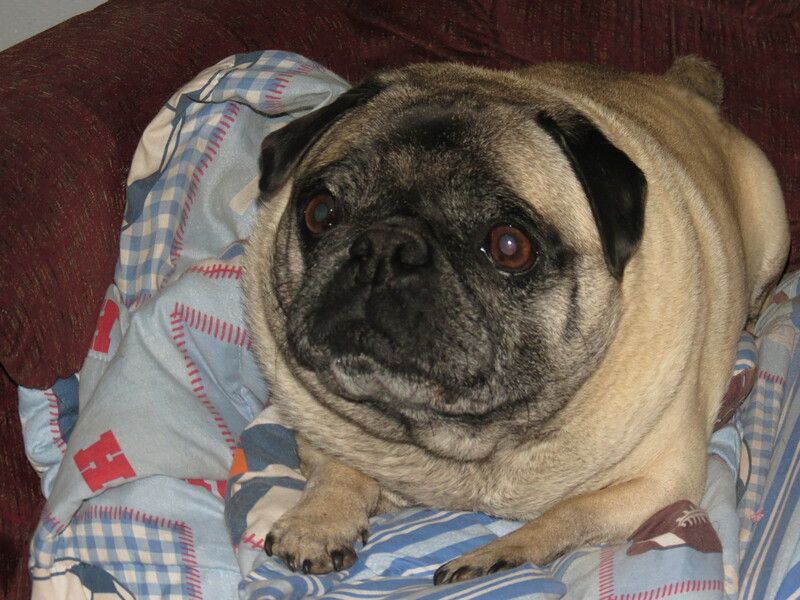 A standard adult Pug weighs between 14 and 18 pounds. What Jasper should look like… The hour glass figure that Jasper doesn’t have. Feeding a Fat Pug: 1 cup of kibbles contains about 700 calories. For example, if the recommendation is 1 cup of kibbles to maintain a weight of 18 pounds, you may want to feed the animal ¾ of a cup. You should always use a standard measuring cup to measure your pet’s food. It also says that in order to control obesity, I have to eliminate all table scraps and snacks until I can bring Jasper’s weight under control. Then, you can give him a treat every once in awhile. I don’t think Jasper will be seeing things my way on this and it may be a battle of the wits. Not sure who is going to win out on this one. He also has to get more exercise. Our other dog Parker is good at keeping the house going in that area and gives Jasper exercise. Next How Strong Would We Be? When I took Jasper to the vet, he said that his problem with his limp was because he was too fat and it makes it harder for him to move with extra fat. Ummm, I should have realized this, lol Since it is the same as with people. the heavier a person is, the harder it is to get around and such. 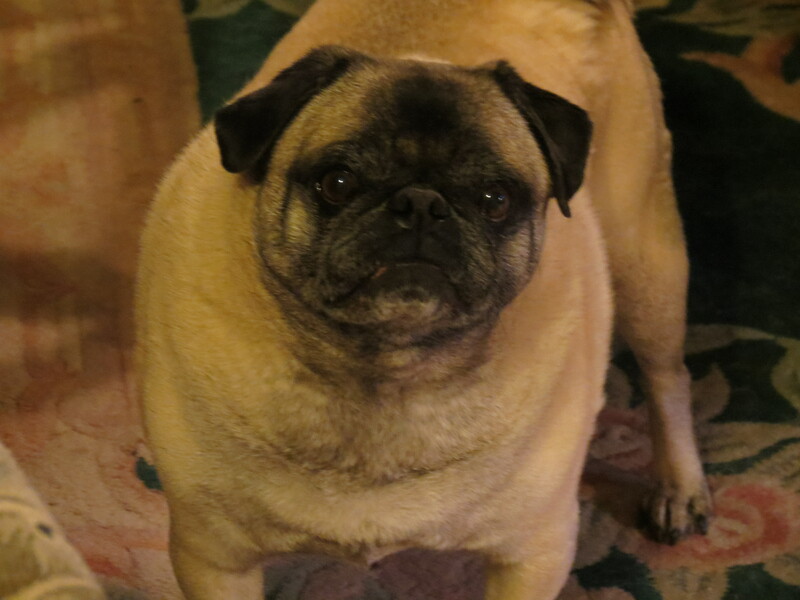 But he said his pug is fat like Jasper too. But I guess they are only suppose to eat about a cup of food a day for their breed. So off to solitary confinement while he eats. I understand Jasper being on a diet. But as your vet should have told you, Pugs are known to be oeverwehight. Where does he want you to have him weigh? He wants him under 20 pounds because of the inflammation on his joints. His right leg is inflamed because of the weight. I had him on a diet and couldn’t figure out why he was still so big. 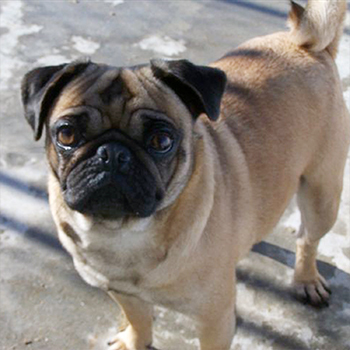 But pugs can get alot of health problems if they are too heavy, mostly joint and breathing. Since they have breathing problems anyhow, the extra weight that is around the neck and such can actually stop them from breathing. They should have a bit of a roll, but not too much.